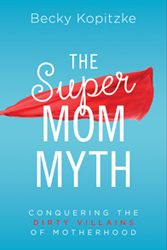 Becky Kopitzke is the author of The SuperMom Myth: Conquering the Dirty Villains of Motherhood (Shiloh Run Press) and Love Forward: Discover the Joy of Living Generously (Bethany House, April 2018). As a writer, speaker, dreamer, believer, lunch packer, and recovering perfectionist, Becky believes family life is one of God’s greatest tools for building our faith, character, and strength—and it’s not always pretty. 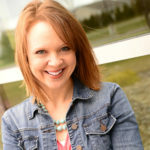 On her devotional blog, beckykopitzke.com, she offers weekly encouragement for fellow imperfect women, pointing our weaknesses, blessings, and victories to God. 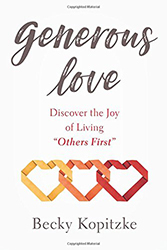 She is also a regular contributor to Kirk Cameron’s TheCourage, The Better Mom, and For the Family. Becky lives with her husband and their two lovely daughters in northeast Wisconsin, where she shares a home office with stacks of tween craft supplies. Beyond writing and family, Becky ministers at her regional evangelical church, Appleton Alliance, where she leads women’s Bible studies, sings on the worship team, and is a frequent featured speaker. Blythe Daniel believed in me even before I did. I owe my success to her hard work, commitment, and friendship. Blythe is a wonderful mentor and advocate for authors, always looking out for our best interests as writers. She is unafraid to offer constructive feedback, yet she's also the first to provide encouragement and support. She also takes a genuine interest in me as a person, as well as my family. Blythe is wonderfully knowledgeable and invested in the Christian book industry for all the right reasons - to share truth and biblically sound encouragement, something I am equally passionate about. Since we met, Blythe has been a wise guide on my journey from blogger to author, most recently securing me a two-book contract with an outstanding publisher. I cannot thank her enough for what she has done to open doors in my writing ministry. God is using her in magnificent ways!